KUALA LUMPUR: Today marks the birthday of Jin, the hunky member of K-Pop sensation BTS. And fans of the uber popular South Korean group, dubbed Army, have naturally been sharing their love for the music idol on Twitter. According to Soompi, the list of worldwide trending topics was dominated after midnight by hashtags that included #OurEpiphanyJin, #HappyJinDay, #ShiningAndPreciousJin, #석진이는_온_세상의_빛 (Seokjin is the worldwide light) and his actual name Kim Seokjin. 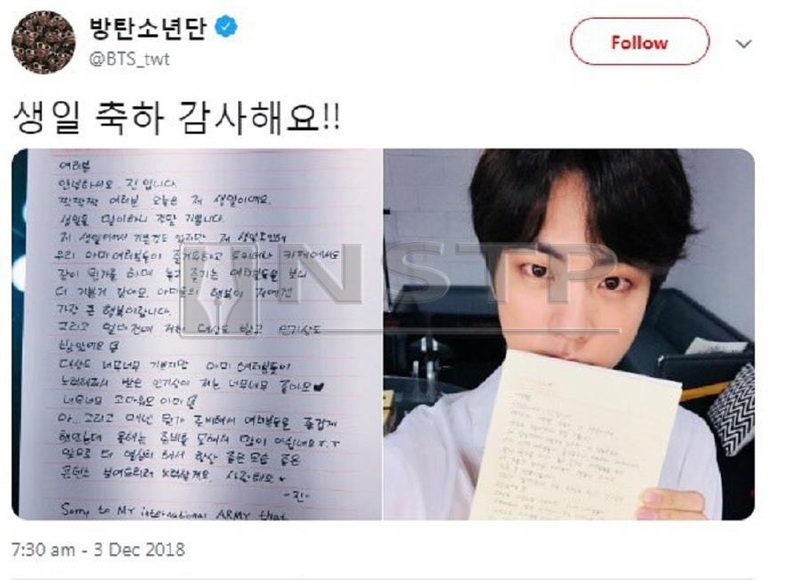 The 26-year-old K-Pop star reciprocated the love by uploading a handwritten letter addressed to the Army in conjunction with his birthday. Jin also commented on BTS’ big wins this year at the MBC Plus X Genie Music Awards, Asia Artist Awards and the recent Melon Music Awards, where the group took home six awards which included two of the grand prizes or daesangs. Jin then expressed his sadness at not being able to do something special for the fans this year. “Every year I’ve prepared something to entertain you, but this year I wasn’t able to prepare anything, which I’m sad about. In the future I’ll work harder so that I can try to always show you a good image and good content. I love you,” he said. The other six members of BTS also celebrated his big day by following the group’s tradition of sharing fun and embarrassing photos of the birthday boy.